We’ve been undergoing a bit of a food revolution in our house over the past few months, trying to eat as cleanly as possible (when we’re home and can control it, at least!) in the interest of being our best and healthiest selves. We eat lots of organic meat and eggs, lots of fruit and veggies (keeping the Dirty Dozen organic, at least), and a little organic dairy, and we’ve majorly reduced our beer and wine consumption. It’s been tough, but worth it. Lest you think we’re going crazy, I did bring a caramel apple pie to my friend Christopher’s amazing Thanksgiving dinner and enjoyed every single bite. (Life without any indulgence hardly seems worth living, am I right?) Still, we’re doing the best we can as often as we can. Changing our lunch habits has been a major challenge throughout this process. I used to alternate between Lean Cuisine and turkey sandwiches; Dr. O was eating the previous night’s leftovers, or (horror of horrors!) Lean Pockets, in the event of an emergency. Since I really wanted to get away from processed food, I bought a bunch of glass Snapware at Costco and committed to stocking my freezer with homemade frozen lunches. 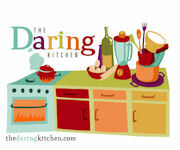 I’ve made lots of delicious recipes (I’ll share them, promise! ), but today’s recipe – Moroccan Vegetable Stew from Peace Meals – is one of my favorites. There’s a lot of prep work with the veggies, but the stew is really simple and tasty. Plus, the ingredients fill my five-quart slow cooker to the brim, which means I have plenty of lunches to freeze. Heat the olive oil in a medium sauté pan over medium-low. Add the garlic and spices and cook until fragrant, about 1 to 2 minutes; be careful not to burn the garlic. Scrape the garlic and spices into a slow cooker. Add the broth and the remaining ingredients (except the yogurt) and stir. Cook on high for 6 to 7 hours. Allow to cool slightly. Purée 3 cups of the stew in a blender or food processor and return to the slow cooker, stirring to combine. Serve warm with a dollop of yogurt, if desired. This is such warm, delicious, comforting food. You probably have to like eggplant in order to enjoy this one, but I just adore the way all the vegetables in this dish come together. I also love, love, love the hint of sweetness from the currants and the slight heat from the cayenne pepper. The first time I made this stew, I was in a huge hurry, rushing to get out the door for some reason. I nearly skipped the almonds since I didn’t want to take the time to toast and chop them. It would have been a huge mistake! I thought it was so strange to put nuts in a slow-cooker stew (surely they would get spongy, right? ), but they add such a wonderful texture and flavor to the dish. TIPS: When I first made this stew, I cut my vegetables into fairly large pieces since I assumed they would cook down quite a bit (especially the eggplant and the zucchini). It didn’t really happen. Now, I use a small dice for the onion, a small-medium dice for the eggplant, and half-moons for the zucchini (and larger carrots). Also, I just put my hand blender right into the slow cooker for a few seconds at the end, rather than dirty my regular blender or food processor. Active time: 15 min. | Total time: 35 min. Preheat oven to 400°F. Line 12 standard muffin cups with paper liners. In a large bowl, whisk together 1 cup flour, cornmeal, granulated sugar, baking powder, and salt. In a small bowl, whisk together yogurt, butter, vanilla, and orange zest. Add the flour mixture, stirring until combined (do not overmix). 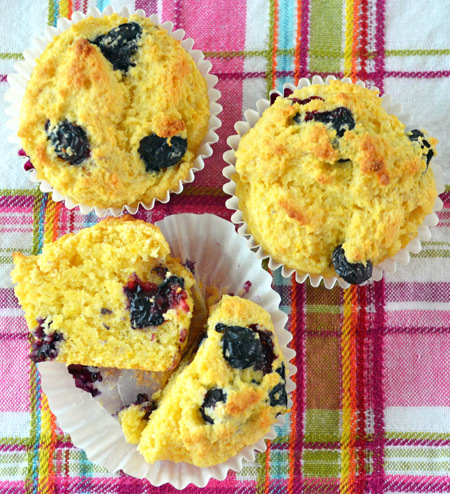 In a medium bowl, toss blueberries with 1 tablespoon flour to coat, then fold into batter. Divide batter among muffin cups. Bake until puffed and set, about 20 minutes, rotating pan halfway through. Let muffins cool in pan on wire rack. I did cut the baking powder to 2 1/2 teaspoons (from 1 tablespoon) out of high-altitude modification habit. I’m not sure if the change was 100% necessary, but it worked for me. I used Mountain High low-fat plain yogurt. This batter is THICK. Don’t be nervous. I used an ice-cream scoop to portion it out. I like a thinner glaze than what the recipe creates. Just add more orange juice if you want to thin it out as well. Yum! 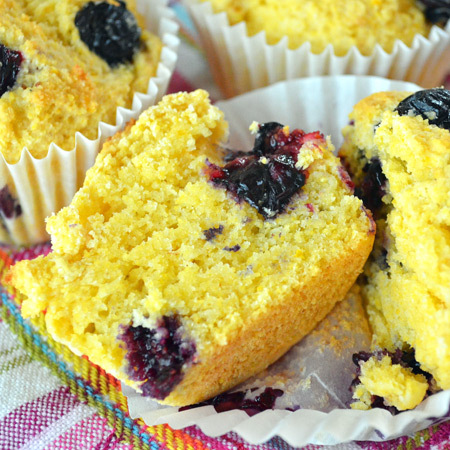 These muffins have a nice, moist crumb and a perfect blueberry-to-batter proportion. They aren’t too sweet on their own, so the glaze complements the muffins nicely. They come out of the muffin liners pretty cleanly too, which I always appreciate. Bonus: Only 4 Weight Watchers PointsPlus points per muffin. I usually have two, and Dr. O (with his unbelievable metabolism) usually has four, so we’re able to get two breakfasts out of the recipe. They are best the day they’re made, but the “here’s breakfast, and I didn’t have to make a new mess” factor makes them almost as good on the second day. It occurred to me today that I might be able to save time for some of you by posting the menus I’ve put together for dinner parties at my house. I try to plan things that go together nicely and that will allow me to do as much work as possible before my guests arrive. (We usually have cocktails and apps around my kitchen island, so the last thing I want my guests to see is me frantically trying to put a meal on the table.) Saving time and lessening stress is always a good thing, right? Last night, Dr. O and I hosted a typical fall dinner party with one exception: we had a vegetarian guest. Now, vegetarians certainly aren’t unusual and I’ve worked with more challenging diets, but I came to realize that I didn’t have many recipes in my entertaining arsenal that didn’t include meat. I first experimented with Hearty Root Vegetable and Mushroom Stew from my copy of The Best of America’s Test Kitchen 2010. While it certainly wasn’t bad, it wasn’t dinner party food; my friend Christopher suggested that I was expecting a miracle out of a vegetable stew. After some discussion, we came up with the menu below for six guests. It seems like a lot of steps, but since I did things like put the bean water and shallot butter on the stove ahead of time, I’d say the actual amount of hands-on work that needs to be done while guests are standing around takes fewer than 10 minutes. Consequently, I can actually interact with and enjoy my guests (the point) instead of working myself into a frenzy (so not the point!). The food turned out really well. I’ve made Perfect Macaroni and Cheese (here’s a link to my post) and Pear and Berry Crisp (my post) before; both are absolutely to die for. The tomatoes and the green beans were perfect complements to the macaroni. I would normally serve a buttery chardonnay (like La Crema Sonoma Coast Chardonnay) with this dinner, but my friend brought a red (2005 La Baronne Alaric) with the dish in mind; it paired beautifully. So that’s my dinner party… What do you think? Do you consider this type of post helpful, or not so much? I’d love to hear from you! Heat grill to medium. In a small bowl, whisk together oil and vinegar; season with salt and pepper. (I used 1/2 teaspoon coarse salt and 1/4 teaspoon pepper.) Brush both sides of mushrooms with oil mixture; starting with stem side up, grill mushrooms until tender when pierced with the tip of a sharp paring knife, 8 – 12 minutes, turning once. Remove from grill; slice 1/2-inch thick. Layer one half of each tortilla with cheese, scallions, mushroom slices, and then more cheese, dividing toppings evenly. 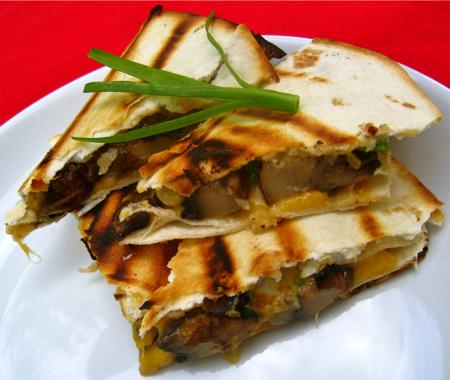 Fold tortilla over filling; using your hands, carefully transfer filled tortilla to grill. Cook until tortilla is slightly charred and cheese is melted, 2 – 3 minutes per side. Serve with salsa and garnish with sour cream, if desired. They aren't exactly pretty, but they sure are delicious. These quesadillas are tasty! The portobellos are so meaty and smoky from the grill, and the ooey-gooey factor from the cheese is fantastic. If you need to please a vegetarian and a meat eater in one meal, this is your ticket; Dr. O said he didn’t miss the meat at all. Plus, the quesadillas are so filling that I couldn’t even eat the whole thing (and I was really looking forward to doing just that, believe me.) I would absolutely, 100% make this recipe again. I telecommute, so I usually get a few more minutes of sleep than Dr. O. (He may think this is an understatement.) I try to get up early at least once a week to make him breakfast, though. One of my favorite quick, no-mess recipes is Yogurt Parfait from the January/February 2005 issue of Everyday Food. There are only three ingredients: plain low-fat yogurt, apple butter, and a banana. I spooned 1/2 cup of yogurt into a glass, topped it with 3 tablespoons of apple butter, and then topped that off with half of a banana, thinly sliced. That’s it! This takes about 3 minutes to assemble, and it’s a great way to start the day. TIPS: The recipe calls for plain low-fat yogurt, but Dr. O and I like to use vanilla low-fat yogurt for extra flavor. If you’ve never purchased apple butter before, you can find it by the peanut butter and jam in the grocery store. It has a really nice “fall” flavor with cinnamon, cloves and nutmeg, usually.